Kartikeya also known as Murugan, Skanda, Kumara and Subrahmanya, is the Hindu god of war. He is the son of Parvati and Shiva, brother of Ganesha, and an important deity found all over the Indian subcontinent in its history particularly worshipped in South India and Sri Lanka as Murugan. He is found in many medieval temples all over India, such as at the Ellora Caves and Elephanta Caves. 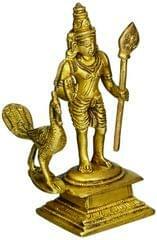 The iconography of Kartikeya varies significantly; he is typically represented as an ever-youthful man, riding or near a peacock, dressed with weapons. 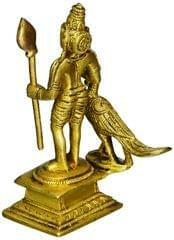 This statue sculpted by Indian artisans out of pure solid brass is a strong example of Indian workmanship and uniqueness.